-Helen Keller, American author, political activist, and lecturer. I’m concerned that many leaders today lack a Grand Vision which causes confusion, fear and lack of hope for the future. A Grand Vision inspires hope and unites people together for the better good. Some time ago I was hired to present a keynote and facilitate a series of half-day programs on leadership, communication and the power of imagery to both mid-level and senior management of a large oil company. With laser-like intent, I laid the groundwork for what I considered the heart of motivation and passion for achievement in teams, communication and the individual. At what I thought was the appropriate time, I asked the group a simple question on which I would base the entire program: “What is the vision of your company? I thought they might be self-conscious or shy, so I gently encouraged them by giving examples. The room grew deadly silent. Everyone was looking at each other. A sinking feeling began to creep into my stomach. “Your company does have a vision, doesn’t it?” I asked. I was dumbfounded. How could any group or individual strive toward clarity of purpose, greatness and mastery without a vision, especially in the era of technology overwhelm, constant change, environmental challenges, increasing competition and rapid communication? Perhaps they can maintain and even grow in small increments and they might even be able to survive; but they can’t expect to take quantum leaps – with passion – without a vision. Many corporations, businesses, organizations and individuals not only lack a vision, but they are also unaware of the power that a vision generates. They make the common mistake of equating a mission statement with a vision statement. Many individuals also neglect identifying life priorities and values. They setting a goal is the same as defining a vision and letting their goals be driven by the vision. A goal is a baby step toward a vision. A goal, whether short or long-term, is limiting. It has a beginning and an end. A vision is ongoing, open-ended and limitless. A goal task-oriented; a vision is process-oriented. A goal can be boring, mundane, and non-inspirational; a guiding vision provides the energy, power and passion to achieve goals. Immensely so. A vision is vital to achieving true success! It’s at the core of motivation and passion. Having and communicating a vision are the primary traits of true leaders. We either create our destiny, or we live out someone else’s creation. A vision is like a lighthouse, which illuminates rather than limits; It provides direction. Almost all successful individuals and organizations have one thing in common: the power and depth of their vision. A positive, meaningful vision of the future, supported by compelling goals, provides purpose and direction in the present. First of all, a vision of magnitude is greater than the individual. A vision may be eliminating world hunger, cleaning up the environment, volunteering to serve others or raising the quality of education. A vision expresses our values and what we hope to contribute. It’s about creating an organization that expresses our deepest values about work, family, or community. Vision transforms momentary strategies into a way of life, engenders change and energizes the mundane. 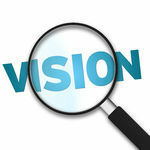 Vision is creating an ideal future with a grand purpose of greatness. It plays a core role in many activities – ranging from career choices to family vacations, from the quality of relationships to surviving acquisition and mergers. Vision gives us the capability to deal with change. A Grand Vision is about others. In order to create a grand vision, we have to challenge the short-term, quick-result, “me, me, me” way of thinking. A vision of greatness must focus on service, adding value to and empowering others. The long-term success of any organization represents more than market share or profit. Long-term success reflects making a contribution to others. A Grand Vision is idealistic. A Grand Vision comes from the heart. ‘Your vision will become clear only when you can look into your own heart. It’s not necessary for a vision to be practical or reasonable. Goals are practical and reasonable. The loftiness of a vision may seem as though it asks too much of us. If it does, that’s the signpost that you are on the right track. A grand vision often requires sacrifice, giving up short-term satisfaction for a long-term payoff. Authenticity means the vision statement comes from you – and no one can create the statement for you. A vision must be personal in order for us to “own” it and it must be recognized as uniquely ours. The vision must be an extension of our personal being. A Grand Vision takes a quantum leap from the ordinary. If it spells out our highest ideals and wishes, it stands to reason that it will stand above the commonplace. It will set us apart from the crowd. Think Amazon, Tesla, Southwest Airlines, Apple, PepsiCo, Make-A-Wish Foundation, Save the Children or the Cleveland Clinic. “I’ve learned that fear limits you and your vision. It serves as blinders to what may be just a few steps down the road for you. The journey is valuable, but believing in your talents, your abilities, and your self-worth can empower you to walk down an even brighter path. Grand Visions are not handed down from above. They are not dictated or manipulative. Grand Visions are created and crafted by those who will be living the vision. And, a Grand Vision has little value unless it is clearly communication. Creating and communicating a vision is key to standing out as a leader. What is your vision? Think about it.